Noah specializes in emergency and critical care practice. He has worked in private emergency/referral practice as well as in academia at the University of California–Davis Veterinary Medical Teaching Hospital. Mr. Jones has a strong interest in infectious disease prevention and critical care nursing of infectious patients. This article was originally published in the March/April 2013 “Today’s Technician” column of Today’s Veterinary Practice. Today’s Veterinary Practice is the NAVC’s official, peer-reviewed journal for veterinarians. You can find the full list of “Today’s Technician” articles on the Today’s Veterinary Practice website. Postoperative patients are among those at highest risk for nosocomial infection. 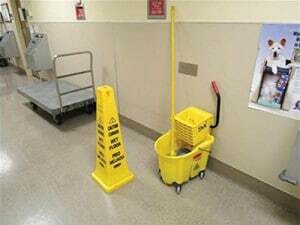 Strategies for disinfecting personnel, equipment, and the surgical suite are meticulously outlined. Nosocomial infections increase morbidity and mortality in patients as well as cost to clients. Antimicrobial resistance further complicates nosocomial infections by increasing morbidity, mortality, and cost. Receive drugs that alter the normal physiology of the patient. All of these factors can modulate a patient’s immune system. Veterinary health care teams must take precautions to minimize the risk of transferring pathogens between patients and maximize their ability to fight infection. Discharge from wounds or surgical sites. Due to lack of uniform reporting and surveillance, veterinary nosocomial infection rates are unknown, though it has been found to be a common problem encountered in veterinary teaching hospitals.3 Additional research is needed to determine the frequency of nosocomial infections in private veterinary practice as this data does not exist at this time. Antimicrobial resistance (AMR) occurs when a pathogen develops resistance to 1 or more agents to which the pathogen was previously sensitive.1 AMR is a growing problem in both human and veterinary medicine.1 AMR has become more common in nosocomial infections, although the 2 are not synonymous. AMR often occurs due to inappropriate antimicrobial administration, causing selection for resistant organisms, but can also occur in the face of appropriate antibiotic administration.1 In the latter case, the gastrointestinal tract is a reservoir for resistant organisms, which can then be transferred from patient to patient. About 30% were found on stethoscopes, with 50% of personnel reporting that they almost never cleaned their stethoscopes. 6% were found on thermometers, with 30% of hospitals reporting that thermometers were not cleaned between patients. 60% were found on cage doors, with 30% of hospitals reporting that cage doors were not disinfected between patients. Pathogen transmission in hospitals occurs most often via contaminated hands of health care workers.2 Although our patients are handled differently than human patients, it is likely that pathogen transmission still occurs frequently via contaminated hands. Therefore, hand hygiene should be a high priority in any health care setting. Washing hands in running warm water, with sufficient volume of antimicrobial soap to cover all surfaces of hands/fingers in lather. Rubbing for at least 15 seconds before rinsing. Using paper towels or single-use cloth towels to dry hands. Turning the faucet off using the towel. Figure 1. Proper hand hygiene is critical for prevention of nosocomial infection. Using a sufficient volume of alcohol-based hand sanitizer to cover all surfaces of hands/fingers. Rubbing for at least 15 seconds before hands are dry. Gloves can be used to prevent gross contamination of the hands, but are not an alternative to proper hand disinfection. Gloves should be worn while handling every patient and hand disinfection should be performed after carefully removing contaminated gloves. Even though clean gloves are used with each patient, hands can become contaminated during glove removal and hand disinfection prevents any transfer of pathogens from one patient to another. Educate staff on the importance of proper hand hygiene: Staff should understand why hand hygiene is important and the implications of poor hand hygiene. In-service educational programs, posters, and other literature can be useful as educational tools. Verify appropriate hand hygiene technique: Proper technique should be demonstrated to all staff members. 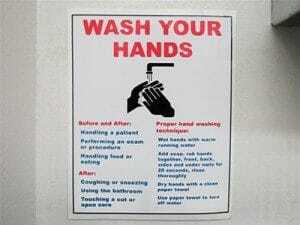 Reminders of proper technique may be posted at sinks and other hand hygiene stations (Figure 2). 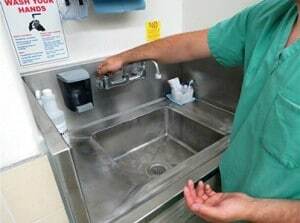 Ensure hand hygiene is available at point of care: Ideally, someone is assigned the task of refilling dispensers and ensuring availability of adequate supplies. Checklists may be especially useful for this purpose. Continually monitor compliance while providing feedback: Staff should be regularly evaluated on proper technique to ensure ongoing patient safety. Written examinations and direct observation are useful in monitoring compliance. 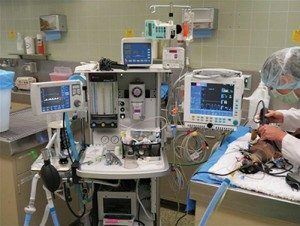 Additional routes of transmission include contaminated environmental surfaces and equipment.3 Proper environmental disinfection is challenging for veterinary teams as patients are not usually confined to a hospital bed. Many disinfectants become unstable after dilution, and must be changed daily, while others may be stable for months.7,8 consultation with your disinfectant manufacturer for stability in-solution information is recommended. Sodium hypochlorite (1:10; contact time will be longer compared to low-level use7). The Centers for Disease Control and Prevention have published guidelines outlining methods of disinfection and sterilization, available agents, concentrations, contact times, and special considerations. These guidelines are available at cdc.gov/hicpac/pdf/guidelines/Disinfection_Nov_2008.pdf. Disinfection using appropriate contact time. Figure 3. Effective disinfection is ensured by proper disinfection protocols and care of disinfection equipment. However, consideration of proper disinfectants, dilution, and contact times are not sufficient. A separate mop bucket/head should be used for the surgical suite to minimize potential for cross contamination. Periodic scrubbing with an intermediate-level disinfectant should be performed on all mop buckets and handles. High-touch surfaces, such as computers, handsets, mobile phones, door handles, and cage handles, should receive low- or intermediate-level disinfection. Figure 4. Patients under anesthesia for surgical procedures are at higher risk for nosocomial infection. A clean area should be used to store new items and drugs; a dirty area should be used to store items specific to the current patient, such as monitoring equipment and predrawn drugs. A plastic bag or tub works well as a dirty area to isolate patient-specific items while maintaining portability throughout the hospital. All surfaces and equipment should be disinfected between patients using an appropriate disinfectant and contact time. Surgical personnel should practice barrier precautions, such as gowns, gloves, masks, and face shields specific to that patient, when a known or suspected infectious patient, such as one with a positive culture or zoonotic disease, is in the surgical suite. Street clothes should never be worn in the operating theatre. Research has shown that, when compared to street clothes, scrubs reduced airborne S aureus levels by 75%.10 Therefore, scrubs should not be worn outside the hospital and surgical personnel should change into clean scrubs before entering the surgical suite. Using forced-air blankets, heating pads, heat-moisture exchangers, low-flow oxygen, and minimizing surgical preparation time can all reduce the likelihood and severity of perioperative hypothermia. Use of forced air blankets, however, should be delayed until final sterile draping of the patient to minimize the likelihood of foreign material or pathogens being blown into the surgical field. Aseptic technique is essential, and any breach of the sterile field should be immediately brought to the surgeon’s attention. Careful inspection to ensure proper function and decontamination. Nosocomial infections and AMR are life-threatening problems for veterinary patients, especially surgical patients. Proper hand hygiene, surface disinfection, and surgical etiquette are essential in minimizing risk and obtaining positive outcomes in veterinary patients. Further research is necessary to determine the rate of nosocomial infection, organisms responsible, risk factors, and recommended interventions for patients at risk. Ogeer-Gyles JS, Mathews KA, Boerlin P. Nosocomial infections and antimicrobial resistance in critical care medicine. J Vet Emerg Crit Care 2006; 16(1):1-18. Institute for Healthcare Improvement. How-To Guide: Improving Hand Hygiene. Available at shea-online.org/assets/files/IHI_hand_hygiene.pdf, assessed June 16, 2012. KuKanich KS, Ghosh A, Skarbek JV, et al. Surveillance of bacterial contamination in small animal veterinary hospitals with special focus on antimicrobial resistance and virulence traits of enterococci. JAVMA 2012; 240(4):437-445. Eckholm NG, Outerbridge CA, White SD, Sykes JE. Prevalence of and risk factors for isolation of methicillin-resistant Staphylococcus species from dogs with pyoderma in northern California, USA. Vet Derm 2013; 24(1):154-234. Nakamura RK, Tompkins E, Braasch EL, et al. Hand hygiene practices of veterinary support staff in small animal private practice. J Small Anim Pract 2012; 53(3):155-160. Shea A, Shaw S. Evaluation of an educational campaign to increase hand hygiene at a small animal veterinary teaching hospital. JAVMA 2012; 240(1):61-64. Portner JA, Johnson JA. Guidelines for reducing pathogens in veterinary hospitals: Disinfectant selection, cleaning protocols, and hand hygiene. Compend Contin Educ Vet 2010; 53(3):E1-E12. Eleraky NZ, Potgieter LN, Kennedy MA. Virucidal efficacy of four new disinfectants. JAAHA 2002; 38(3):231-234. Loftus RW, Koff MD, Burchman CC, et al. Transmission of pathogenic bacterial organisms in the anesthesia work area. Anesthesiol 2008; 109:399-407. Bischoff WE, Tucker BK, Wallis ML, et al. Preventing airborne spread of Staphylococcus aureus by persons with the common cold: Effects of surgical scrubs, gowns, and masks. Infect Control Hosp Epidemiol 2007; 28(10):1148-1154. Sessler DI. Non-pharmacological prevention of surgical wound infection. Anesthesiol Clin 2006; 24(2):279-297. American Society of Health System Pharmacists. ASHP Therapeutic Guidelines on Antimicrobial Prophylaxis in Surgery. Available at ashp.org/s_ashp/docs/files/BP07/TG_surgical.pdf, accessed January 31, 2013. Knights CB, Mateus A, Baines SJ. Current British veterinary attitudes to the use of perioperative antimicrobials in small animal surgery. Vet Rec 2012; 170(25):646. Crow S. Protecting patients, personnel, instruments in the OR. J AORN 1993; 58(4):771-774. Nicholson M, Beal M, Shofer F, Brown DC. Epidemiology evaluation of postoperative wound infection in clean-contaminated wounds: A retrospective study of 239 dogs and cats. Vet Surg 2012; 31:577-581.